We use the best garage organization products available, including whatever you need for your garage floor, garage storage cabinets or garage shelving. 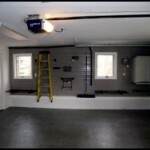 Whether it’s wall panels, shelves, bins, hooks, cabinets or flooring, TLC Garage Works, Inc, has a garage organization solution that will meet your specific storage needs. Our products represent the best storage solutions available, and come from some of the finest manufacturers in the world. Our wall panels are made from rigid thermoplastic, which means the bottom line is strength and durability. Every panel we install is impact resistant, bears heavy loads without bending or breaking, and is designed to stand up to years and years of wear and tear. The best garage storage organizer solution for organizing spray paint cans, bottles, hand tools, cleaners and more. 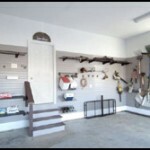 Put your garage shelving at any height to suit not only storage needs, but safety needs as well. 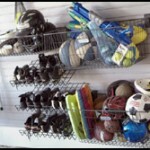 Bins and baskets are a versatile garage organization solution for anything from small tools to shoes and boots. Easy to position at any height for safety and functionality. 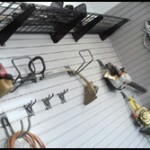 Securely hold everything from garden utility carts to ladders to bikes to heavy tools. A variety of shapes and sizes ensures there is a hook to meet every possible storage need. 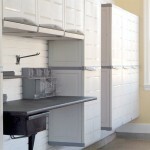 Garage storage cabinets and wall cabinets provide safe and secure storage when floor space is at a premium. Great for bulk storage for chemicals, power tool cases and other supplies. 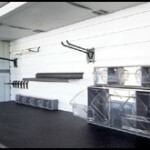 Please ask us about our plastic garage storage cabinet solutions. Our garage floors and flooring solutions are provided by manufacturers with more than 25 years experience in the development and manufacture of environmentally safe epoxy flooring products. Our floors protect against gasoline, antifreeze, motor oil, salt and hot tire pick-up, and are easy to keep clean. In addition, TLC Garage Works, Inc, is the only garage organization company in America that can custom mix the color of your epoxy floor to meet your exact requirement! Read The Super Garage of the Future – What Will Yours Look Like?